There are certain distinctions that are related to those who serve in different sections of the military. For some, you may notice a distinction in dress uniforms, but there are also differences in combat uniforms. Each branch of the military features different camouflage patterns that they are known for, and we discuss which branch has each pattern. 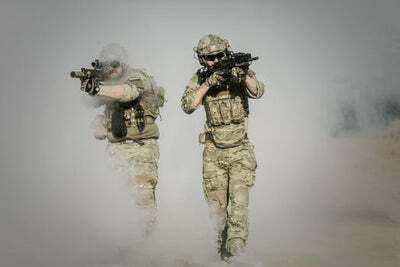 Members of the U.S. Army have two forms of combat uniforms. One is the Universal Camouflage Pattern, and the other is MultiCam, which is used for units deployed in Afghanistan. In 2015, a designated OCP, variant of MultiCam, was introduced and now is the main issued pattern. The Marines wear one pattern in two variants. The MARPAT pattern is available in woodland and desert. The Navy working uniform is available in three variants, blue-grey, desert variant, and woodland variant. Air Force wear digitalized tigerstripe, as well as the MultiCam, depending on where they are deployed. Now that you know what patterns to look for, you can more easily distinguish which branch of the military someone is serving in by the differences in combat uniforms. Dress uniforms also differ, depending on the branch served, but many of these combat uniforms are worn as working uniforms, whereas dress uniforms are only worn on special occasions.